Covering the development of the atomic bomb during the Second World War, the origins and early course of the Cold War, and the advent of the hydrogen bomb in the early 1950s, Churchill and the Bomb explores a still neglected aspect of Winston Churchill's career - his relationship with and thinking on nuclear weapons. Kevin Ruane shows how Churchill went from regarding the bomb as a weapon of war in the struggle with Nazi Germany to viewing it as a weapon of communist containment (and even punishment) in the early Cold War before, in the 1950s, advocating and arguably pioneering what would become known as "mutually assured destruction" as the key to preventing the Cold War flaring into a calamitous nuclear war. While other studies of Churchill have touched on his evolving views on nuclear weapons, few historians have given this hugely important issue the kind of dedicated and sustained treatment it deserves. 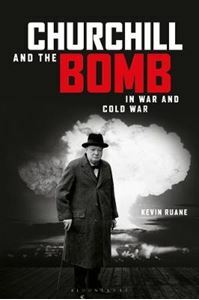 In Churchill and the Bomb, however, Kevin Ruane has undertaken extensive primary research in Britain, the United States and Europe, and accessed a wide array of secondary literature, in producing an immensely readable yet detailed, insightful and provocative account of Churchill's nuclear hopes and fears.